Frequently I want to post a photo of something that is happening with my tomatoes, but it doesn't fit in with any of the ongoing threads, so I've been skipping the post. I'm starting this thread as a handy place to keep a journal of what's going on with the tomatoes in my garden. Over the past few years I have been working on a few tomato breeding/selection projects. I started out in 2009 and 2010 by trialling hundreds of varieties of heirloom and modern hybrid tomatoes: Looking for anything at all that would produce fruit in my garden before frost. Most of them were spectacular failures! Brandywines and beefsteaks self-eliminated very quickly. I don't like providing the labor to pick cherry tomatoes, so they were mostly culled except for yellow pear and Sungold. I was mostly saving seed as bulk lots. Any variety that produced well got dumped into a common fermentation, and mixed with everything else. I did a little bit of selection for frost/cold, because about 10% to 50% of my plants get killed by frost every year, so the most susceptible got eliminated. 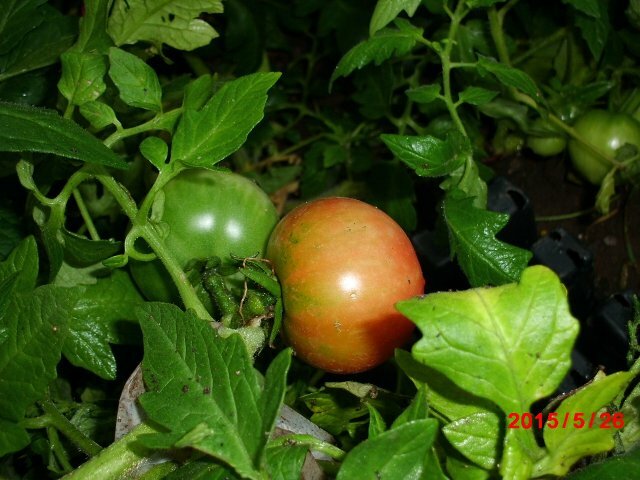 One thing that we learned from the trial, is that I should be focusing on determinate tomatoes because they are more productive earlier in the season. I suppose that my plants had already shown me that, because my bulk seed had ended up being mostly determinate varieties. In the bulk seed collection this fall, I'm intending to do careful screening to only select for determinate plants. I do a little bit of frost tolerance testing each year. One of these years after I get some of the other breeding projects further along, I'm intending to make some crosses to screen for better frost resistance. I grew a flat of tomatoes this year that survived a two day long snowstorm without visible damage. Many plants had already been culled from the flat due to previous radiant freeze damage. Another thing that I noticed during the frost/cold tolerance trial, is that the two varieties that were the most productive were also highly attractive to bumblebees. I'm speculating that they set fruit earlier and more reliably because they were being better pollinated. The flowers shed a dust cloud of pollen when jostled. So that triggered the idea for the breeding project I expect to work on for the next few years: Developing a landrace of tomatoes that are promiscuously pollinating. I'm hoping that will allow me to spin the genetic roulette wheel more frequently in my garden, and lead to quicker development of tomato varieties that really thrive in this area. It will also lead to my garden being full of hybrid vigor. I won't have to suffer through the inbreeding depression that seems so commonplace among the heirlooms that I have grown. Part of my motivation for pursuing promiscuously pollinating tomatoes is that I think they will do a better job of acclimating to late blight. Rather than throwing one highly inbred variety at the problem, I intend to throw a field of tomatoes at the problem, with each plant being genetically unique and diverse. Then those plants that are most tolerant can share genes readily with each other. It might be many different traits working together that provides the best tolerance. And not just a single tolerance gene. To further this project, I am collecting wild tomato genes, and crosses with wild tomatoes. This year I'm mostly expecting to grow seed, so that I can have gobs to sacrifice to testing. 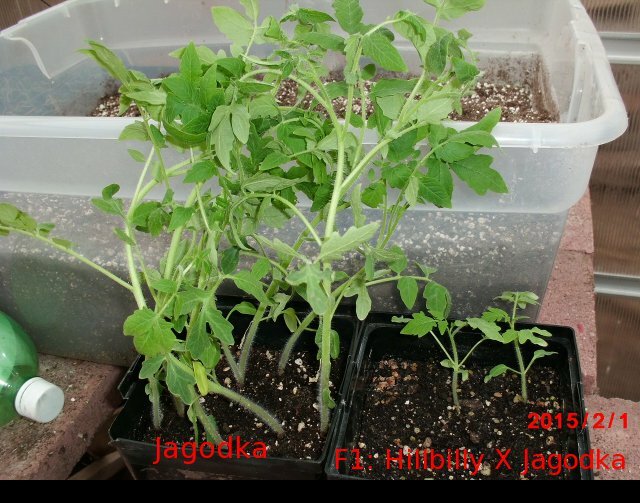 Last summer I made a few hybrid crosses between Jagodka and varieties with open flower structures. I grew out the seed over the winter and collected F2 seed this spring. The final variety to produce seed is ripening now in plenty of time to grow it out this year. The other two crosses already have F2 plants growing. Some of the crosses were with determinate mates. Some were indeterminate. This summer I intend to screen for determinant plants with open flower structures. Last fall at the farmer's market, a lady asked me about the taste of my tomatoes. I finally had to confess: My tomatoes taste horrid. I decided after tasting lots of gaggy tomatoes that I like yellow and orange tomatoes better than red tomatoes. Therefore this spring I started another breeding project to develop tomatoes that are pleasing to my taste buds. I expect that they will end up being orange or yellow. I'm expecting that I will mostly use the orange/yellow tomatoes that I planted this spring as pollen donors to some of the F2 plants -- with determinate growth and loose/open flowers -- from the promiscuous pollination project. One of the F2 Hybrid tomatoes is a cross: [a yellow/red indeterminate beefsteak with open flowers X a determinate pollen donor]. Perhaps I'll be able to find what I'm looking for in one of the offspring: yellow/orange fruit, open flowers, determinate plants. I love working with recessive genes, because once I isolate a phenotype, then it is fixed until the plant cross pollinates with something that doesn't carry the recessive gene. Last edited by joseph; May 26, 2015 at 10:22 PM. Joesph I always enjoy reading your posts. Your common sense approach to producing a crop is great. sometimes I think people in my area are too hung up on trivial folklore behind their tomatoes. I'll definitely be following around. I enjoy breeding project and crossing posts best of all here. Post early and often! A really interesting project. I wish you a lots of fun and I look forward to updating. Joseph, very inspiring! People often choose tomatoes by their cute name, even though they've never tasted them. Who cares! Just one note on the color though. Orange tomatoes are a favorite of myself and my partner, but for sauce it tastes less flavorful on its own. The oranges need to be mixed with at least half red to taste Italian enough for me to eat with pasta. I've eaten my fair share of all orange sauce last season but lesson learned going forward. Love it fresh though. I prefer an orange tomato before a red red too. If I was doing this I would be breeding what tasted good to me too. Good on you Joseph. I wish you the best of outcomes for your project. Makes sense to me Joseph. We are learning what grows well here and what doesn't. The other day, I pulled out a Japanese Black Trifile plant that was growing right in the middle of our garden. All the other plants look really healthy, but not the JBT. I'll try it again next spring because of all the rain and overcast skies might be what did it in. I like your ideas Joseph. Best of luck with all aspects of your projects, Joseph! FYI Yellow fruit is recessive to red. Orange fruit genes are not alleles of yellow/red, there are 4 different genes that produce orange fruit, at least 3 seem to be fairly common. tangerine is recessive, but tt supercedes red. prolycopene instead of lycopene. Other alleles of the tangerine locus are not known afaik. Beta is dominant, and will show up visibly even as Bb - orange-red. beta carotene instead of lycopene. Crimson and og are alleles of the same locus. Other 'orange' genes include delta and apricot... Delta at least does occur in some OP's. Apricot may be a little harder to track down. I suppose that I should make a disclaimer that I am not a geneticist. So when I say yellow or orange, I probably mean "not red". I suspect that I'll only concern myself with phenotypes, which I can observe with my eyes, and not with alleles which I cannot see. I think that I was being premature in judging the color of a hybrid fruit. This morning it looked like it was going to ripen to yellow (like it's mother). This evening, it looks more like the fruit is going to be red (like the pollen donor). Edited previous post... Guess we'll know in a couple days. Mother Hillbilly or Virginia Sweets (a bicolor, more yellow than red, indeterminate, with open beefsteak type flowers and fruit). Father Jagodka (a red saladette, determinate, with industrialized flowers). Last edited by joseph; May 26, 2015 at 10:49 PM. There's different genes for orange. Most of the orange tomatoes are lower in lycopene. I believe when crossed with red tomatoes the red is dominant. A few of the orange tomatoes have a different gene that makes the tomato high in beta carotene (actually there is at least one more pathway to orange, but I don't believe that genome is available commercially). It is sort of 'co-dominant' with red so crosses between this type of orange and red give you an orange-red fruit color in the first generation. I'll be interested in seeing what your results are. Joseph, thanks for starting this thread. I was curious about what you were doing so I will follow with interest. Do update us soon on the progress of that gorgeous tomato! If I am not mistaken Joseph must meet a fair load of challenges. He lives far from his farm, so has to work quickly and efficiently whenever he is in the field. As a professional he needs a good production yet keeps an adventurous spirit and doesn’t stick to the most common varieties. I would suggest exploring Russian-Siberian tomatoes. Every year I plant Northern Lights, It starts giving fruit early and only stops when it starts freezing. See a description in Tatiana’s catalog. I’m sure there are plenty of others. loulac, thank you for the review of Northern Lights. Some say it is the earliest bicolor, or perhaps it is just more cool tolerant. I look forward to growing it next year. Also, I think your assessment of Joseph's situation is astute. It is clear he has an adventurous spirit! I thought the hybrid fruit was ripe enough today, so I harvested it... I also harvested a fruit from the pollen donor line. It is a hybrid that was grown in the basement overwinter then planted into the greenhouse. 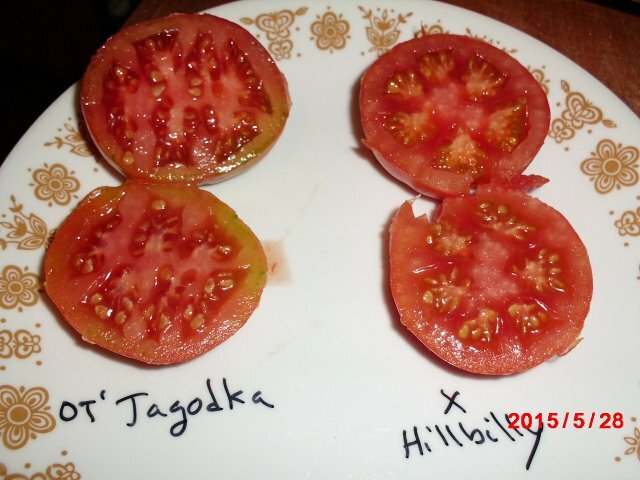 The mother was Hillbilly or Virginia Sweets, which are bicolored (yellow/red) indeterminate beefsteak tomatoes. Very large fruits by my standards. The hybrid plants grew extremely slow for me in the basement, in front of an east facing window, under grow lights. This photo compares the growth of the hybrids to the growth of the pollen donor. The hybrids grew very slowly and flowered much later. If they had been a member of the general population, I would have culled them a long time ago. Today, the plants are growing strongly, and they are indeterminate, so they just keep getting bigger and bigger. Jagodka is pumping out lots of ripe fruits. The hybrid might get around to producing more some day. Here's what the hybrid fruit looked like, compared to the pollen donor line. The fruit is the same size as Jagodka. The fruit color was red, which shows that the cross was successful. Taste between them was so close that I couldn't tell a difference. In other words bleck! The yellow color was indeed recessive to red. I'm currently fermenting the seeds. It produced a lot of them! It's about 5 weeks after I like to plant my tomato seeds, but some of them should do fine in spite of the short season. Nice pics Joseph! Good luck with your experiments.